The Happy Jacks, a student a cappella group at the University of Wyoming, will perform a free send-off concert Friday, Oct. 9, at 7:30 p.m. in the Fine Arts Center concert hall. The group will then travel to perform an invited concert at the International Arts Festival in Shanghai, China. Music selections for the UW performance include arrangement standards such as "Africa" by Toto, as well as original arrangements including Britney Spears' "Circus." Since its founding six years ago by UW Singing Statesmen students, the Happy Jacks have promoted UW and male singing. The ensemble takes an annual state tour, but this 10-day visit to China marks the Happy Jacks' first international appearance. Assistant professor Nicole Lamartine, associate research scientist Zhaojie Zhang and assistant professor Jeff Selden will accompany the students. The ensemble was invited by Shanghai Normal University (SHNU) and Dean of the College of Arts and Sciences Oliver Walter to perform at SHNU's main and Fengxian campuses for an international arts celebration in honor of the university's 55th anniversary. SHNU's Girls Choir will open for one of the concerts and participate in a clinic and musical exchange with the Happy Jacks. 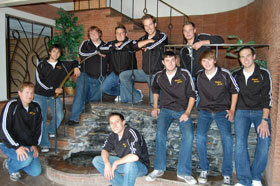 Members of the 2009-2010 Jacks are Jeff Gonda, Westin Grabow, Aaron Herrera, Jake Humphrey, JC McCann, Ian Miller, Michael Morgan, Griffin Murphy, Caleb Robinson and Erik Stratton. Former members Jacob Gantz, Karl Heimbuck, Jacob Means and David Webber and former business manager Shelby Means will rejoin the ensemble for the China concert. Donations to help fund the trip can be made through the UW Foundation's gift-processing department using appeal code M10HJ. More information about the Happy Jacks can be found at www.uwyo.edu/happyjacks, or e-mail the group at happyjacks@uwyo.edu.